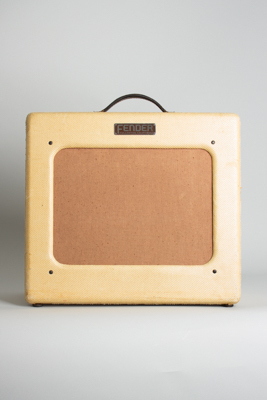 Fender Deluxe Model Tube Amplifier (1951), made in Fullerton, California, serial # 3539, tweed fabric covering finish. Height is 16 1/4 in. (41.3 cm. ), 18 in. (45.7 cm.) width, and 7 1/2 in. (19 cm.) deep. This early TV-front Deluxe remains in far better condidion than many, both externally and under the hood. The old-style un-lacquered tweed covering is not "smoked" like most and shows only some light wear-mostly on the lower corners. There is just some very minor corrosion to the faceplate. Even the somewhat fragile original leather handle is still intact. Internally the amp has a mix of later tubes and a well-done cap job with no major mods, just a 3-prong cord added. This Deluxe was originally wired by Lupe (whose masking tape name tag is still present inside the chassis) with pots dated to the second half of 1950. The original Jensen speaker is date coded to the 5th week of 1951. The amp sounds great and runs very quietly with new filter caps. This is a lovely example of this all-time classic gigging and recording amp, the nicest we have seen in a while. Excellent Condition.